While not nearly as much as you’ll spend on rent, utilities are a pretty big expense in any home. Trying to cut down on that takes many different forms: from very basic things that take little effort, to bigger changes that take a lot of effort. Whichever you use, they can be a great help to save money on utilities. When you use warm or hot water, you need to use energy to heat the water as well as running the machine. Most clothes can be washed just fine in cold water, saving the use of hot water. You have two choices here: either program your current thermostat better, or get a smart thermostat. The first option is easier, since you probably already have one installed, and you just have to tell it what time to be at what temperatures. A smart thermostat costs more, and requires approval from your landlord to install, but gives you greater control over the temperature at any given time. The more junk that gets caught in the filter, the harder your heater/AC needs to run to get the same result. If you replace it every month, you’ll rarely have to deal with that issue. You know how incandescent light bulbs get really hot? That’s the energy they’re using that’s not being converted to light. Replacing them with compact fluorescent or LED bulbs will require a lot less energy for the same amount of light. It’s up to you whether or not to replace them all at once or wait for them to burn out, but either way, the new ones will be a lot cheaper to use. 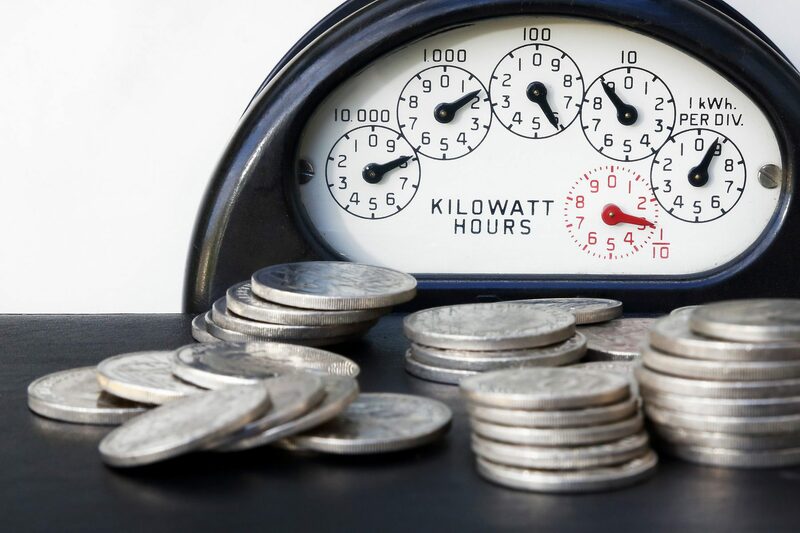 If your utility company charges more to use electricity during peak hours, it can make a big difference to run big things during non-peak hours. Saving the dishwasher or laundry for the evening can save you a fair amount of money while just moving the time you have to press a couple buttons. This might seem unorthodox, but putting up a bit of clothesline can save you having to run your dryer at all. If you don’t need your clothes dried in a hurry, it can save you a fair amount in electricity usage. This may not be feasible in all situations, but unplugging things you’re not using can make a big difference in how much electricity you’re using. Arranging your power strips and electrical outlets to be easily accessible is a big help here, making it much easier to unplug something when it’s not in use. It’s cheaper to run a fan than air conditioning, and by carefully positioning your fans, you can get nearly as good of cooling as you would running the AC. It may not be perfect, but it’s a lot better than you might expect. These help a lot in keeping cool in the summer. By letting less light in from the outside, your rooms will heat up a lot less. When you want to let natural light in, just pull them to the side, but the rest of the time they’ll help you stay cooler. Dishwashers are a lot more efficient at using water than you are. If you fill up the dishwasher every time you use it, it’ll use a lot less water than you would washing by hand, and takes you less effort to do, making it a win on all fronts. Your washing machine is going to use about the same amount of water regardless of how much you put into it. By using larger loads, you’ll be getting more of your clothes washed for the same amount of water. If your landlord allows it, that is. These are replacements for faucets, shower heads, and the like that are designed to use less water. Switching over to those can be an attractive idea, especially since they’re also designed to have high water pressure when being used, despite using so little water. This one can take some time, but also make a huge difference. This is especially common for internet, phone, or cable bills. If you call up and threaten to cancel or look elsewhere for your service, they’ll often make you a better offer to get you to stay. If that doesn’t work, there’s always the possibility of cutting back your service or dropping it entirely, if it’s something that you can spare. Do you need the really big cable package, or a cable package at all? Would you do okay with a slightly lower speed internet connection? Any of these can save you a lot of money over time, even though they take a lot of effort upfront. If you’re wearing a sweater indoors in the summer, there might be an issue. You’re using a lot of energy to cool your home so much that you need to warm up. You’re better off running the air conditioning less and dressing more like you would if you were going outside. The same goes for winter - wearing a sweater inside means you don’t need to run the heat nearly as much. If air is leaking to the outdoors, you’re going to end up spending a lot more on either heat or air conditioning. Being proactive about plugging these leaks will save you months of wasted attempts at heating the outdoors. There's always more that you can do to save money on utilities. Just use these as a starting point, and you'll be well on your way to getting better.